Most Americans, and maybe most journalists also, still tend to think of Russia as the Soviet Union, a towering monolith that can swallow up the US. 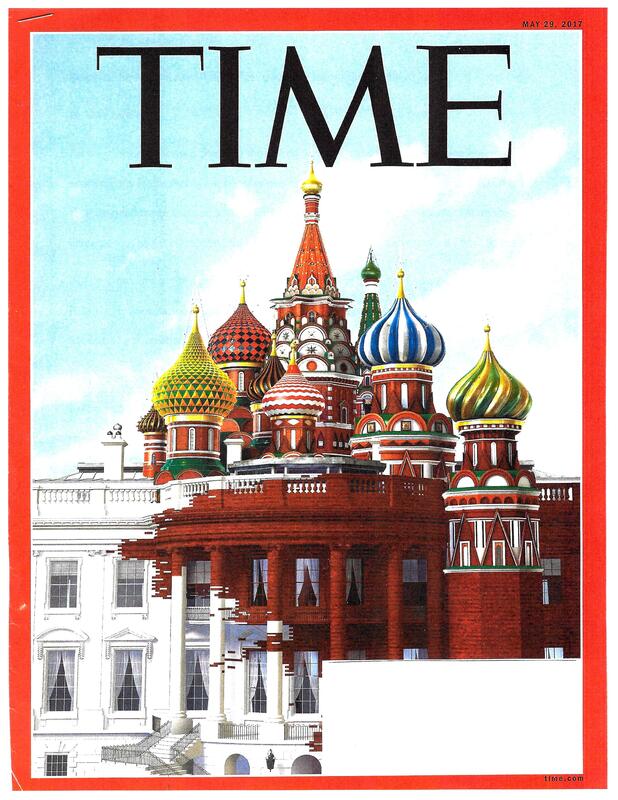 Time Magazine gave in to this “fear of the Beast” thinking this May in the cover picture shown above. They want us to fear and feel horror about the Russian Beast, even now in 2017. Should we feel the same about Mexico? No, mostly we pity Mexico and its government. Yet our monolithic view of Russia – which may have been accurate up to the 1980’s – has not scaled down since that time to reflect the reality of Russia’s loss over the past 25 years of most of its economic strength. The following numbers, along with the Russian numbers above, are from the CIA World Factbook, so we may assume they are at least somewhat reliable. The countries of the European Union have enormously stronger financial bases than Russia. In Germany alone, the Gross Domestic Product (GDP) is USD$3.495 trillion. In France the GDP is USD$2.488 trillion. According to the World Economic Forum, the GDP of the whole European Union taken together is USD$11.820 trillion. These European Union nations say they are the most afraid of Russia. They are so much bigger and stronger than Russia, that their fear resembles the fear Australia may have over being invaded and overpowered by New Zealand. Remember, the GDP of Russia is only about USD$1.28 trillion. Compare that with the lofty numbers above for our European Allies. And we haven’t even yet examined the economic strength of the United States, whose drastic fear of Russia would seem almost comical if it didn’t have such real-world consequences. The GDP of the United States is the largest in the world. At $18 trillion, it represents a quarter share of the global economy (24.3%), according to the latest World Bank figures. Vladimir Putin is a very handsome man, the very model of a modern head of state. He has used a lot of paint to make all the government buildings in Moscow and St. Petersburg appear colorful and vibrant, which they are. He has the almost universal support of the Russian people, which he deserves. All of this grand show of pomp and allegiance is of help for him to maintain the fiction of being a major world leader, which so far he has been successful at doing. Of course he and his comrades are not to be trusted. Our State Department and security establishment, however, is quite robust enough to handle most of the untrustworthy things that come out of Russia. Just remember, though: Russia does not have the economic resources to do us any great harm. We need their cooperation and we need for them to be an ally. Colorful graphics are a good way to artistically visualize the comparative size of the Russian economy. 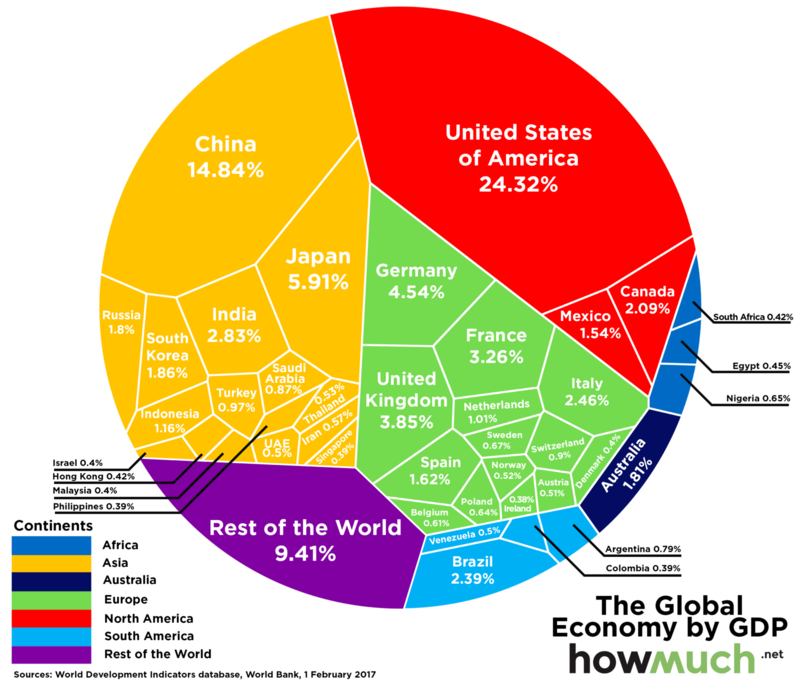 You have to search a little to find the Russian percentage of the world economy tucked away in a small and insignificant arc of the graphic below. (Click the graphic to enlarge if you can’t find Russia.) Yet this is the rock-bottom truth about Russia: they are not a threat to the United States or the European Union or most any other country now, in 2017. Drop the sanctions. Recognize that the Crimea is now a part of Russia. Come up with more joint American-Russian cooperation plans for the Middle East. It’s easy to say that Russia still has large stockpiles of nuclear weapons which they could unleash on the US or the world at any time. Considering the size of the Russian economy, though, it’s quite likely they don’t have the funds to maintain their nuclear arsenal, and it’s slowly degrading over time. The real problem is that they may not have enough funds to secure these nuclear arms from theft, or if desperate to raise funds they may try to sell parts of their arsenal. The United States needs to be there with a permanent offer to buy any or all parts of their nuclear holdings at any time and any place (most are surely old and will be destroyed). The only way we can really do that is to make peace with Russia and stop spanking them with sanctions. Our partial partnering with Russia has very much reduced the level of violence in Syria. Before Obama and Trump made the partnership, we had news stories almost every day of extreme numbers of people being killed in fighting in Syria. Now, very few of these stories. Let’s not blow it by continuing to poke at the Russian Bear with insults and restrictions. Of course we must continue to support NATO, yet the threat to Europe from Russia is not nearly as great as it has been in the past. Time to recognize this reality as well. Europe is in more danger from the Middle East and North Africa than it is from Russia, and the US must assist in propping up Europe’s defenses in those parts of the world. ← Global Warming: Darwinian Evolution in Humans?